Wauseon’s JJ Kauffman, right, steals second base in Friday’s ACME district match-up against Findlay. The Indians defeated Findlay twice and split with Perrysburg to reach Monday’s championship game. Brooks Gype catches the throw from the pitcher for the out at first base for the Indians Friday against Findlay. Wauseon was victorious in that contest 6-3. Wauseon’s Brady Kinnersley got the win on the mound on Friday against Findlay. He pitched a total of six innings before being replaced by JJ Kauffman in the seventh. 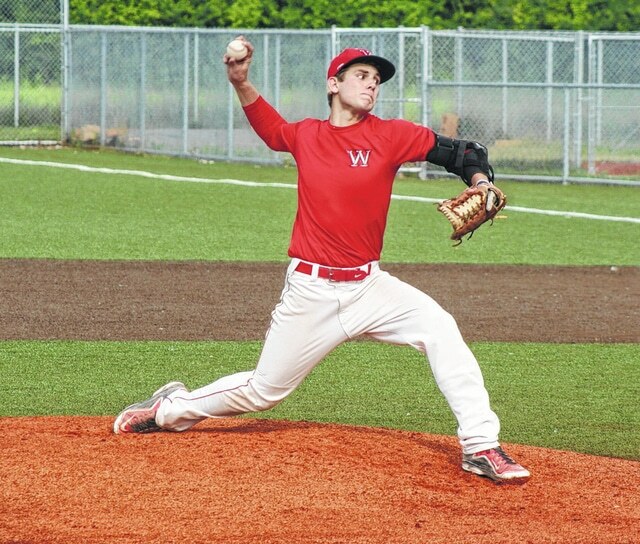 TOLEDO – The Wauseon ACME baseball team picked up three wins in the ACME district tournament over the weekend at Mercy Field, advancing to the championship game. The Indians held off Findlay Friday night, 6-3. They were then beaten by Perrysburg on Saturday before topping both Findlay and Perrysburg on Sunday to stay alive. In their match-up with Findlay on Friday, the Indians trailed 2-0 through three innings of play before battling back to get the win. The early runs for the Trojans came when Nick Berry pegged RBI singles in both the top of the first and third innings. However, Wauseon responded in the bottom of the fourth as JJ Kauffman hit an infield single and moved to third on back-to-back wild pitches. Brady Kinnersley followed that with a walk, while Brady Rupp’s ground out got the Indians on the board. And just when his team needed outs to get the ball back to the offense, Kinnersley, who started the game on the mound, did exactly that in the top of the fifth. He recorded a pair of fly ball outs and a strike out to put the Trojans down in order. “You could tell he started running out of gas there at the end because he is just not in pitching condition yet. But he battled for us,” said Wauseon ACME coach Doug Rupp. Wauseon’s Brooks Gype began the home half of the fifth with a single to left. The pinch runner, Brendan Wilson, stole second, then was moved to third on a sacrifice bunt put down by Carter Stump. Following a ground out, Kauffman doubled to right center field to score Wilson and tie the game at two. “JJ was big at the plate too. He is just rolling right now,” stated Doug Rupp. Then it was Kinnersley’s turn, as the soon-to-be-senior singled to bring home Kauffman, putting the Indians ahead at 3-2. Another hit, this time from Brady Rupp plated Kinnersley after he stole second and made it a 4-2 game. Berry started off the top of the sixth by reaching on an error. Then after Luke Cosiano walked, Cameron Diller hit a bloop single which would have loaded the bases but a base running blunder by Berry allowed Wauseon to throw him out at third. Sam Federick walked to load the bases, leading to a ground out fielder’s choice to plate a run for the Trojans and put the score at 4-3 in favor of the Indians. Federick replaced Aaron Elchert on the mound for Findlay in the bottom half of the sixth, but the Indians were able to take advantage of his miscues. It all started with a two-out walk to Gype. Stump then singled down the left field line, while Josh Whitcomb walked to load the bases. A walk to Kauffman with the bases full made it 5-3, then a wild pitch during Kinnersley’s at bat scored Stump. However, as coach Rupp alluded to, Kinnersley began to wear down while attempting to pitch a complete game. After Findlay’s Nate Miller singled and Drew Givens walked, coach Rupp chose to make the switch to Kauffman. Kauffman did the job by fanning both Elchert and Berry, hitting Cosiano with a pitch, but getting Diller to fly out to end the contest. Wauseon did not need any bullpen help in their match-up with Perrysburg on Saturday. Brady Rupp tossed a complete game, however, his squad did not get the result they wanted as the Yellow Jackets scored a run in the bottom of the eighth to seal the 1-0 win. Both teams had their fair share of chances offensively, and none bigger then in the bottom of the first for the Yellow Jackets where they would leave runners on second and third. Casey Szczublewski started the offense off with a one-out single. Trevor Hafner followed that with a single, but both runners were able to take an extra base thanks to a poor throw from the Wauseon outfield. But Brady Rupp then got Justin Beer to line out, and after Chaz Westfall’s walk to fill the bases, he forced a ground out from Austin Mezinger. Wauseon had a scoring chance in their half of the third when Jacob Raabe led off with a walk and was sacrificed to second on a bunt by Everett Bueter. An out later CJ Moser drilled a ball to deep left center, but a running catch was made by a Yellow Jacket outfielder to retire the side. The Indians’ pitching and defense was hard at work throughout most of the game and in the bottom of the fourth they stranded a one-out triple by Westfall. First Brady Rupp struck out Mezinger for the second out, then after Tyson Kleinfeler walked, Matt Hayes popped up to end the threat. Wauseon again put a pair of runners on in their half of the sixth as Kinnersley and Brady Rupp both singled to roughly the same spot in left field. However, a sharply hit line out from Travis Smith, a strikeout, and a hard hit liner by Bueter to right field that was ran down by the Perrysburg outfielder kept the game scoreless. The contest would be forced into extra innings, and in the top of the eighth, Kauffman started things off with a single. Kinnersley sacrificed him up with a bunt, but a ground out and fly out left another runner on base for the Indians. A communication error by Wauseon allowed Hafner’s blooper to left to drop down in play in the bottom half of the inning, placing the winning run aboard. Hafner stole second, and Beer drove him home with a single to center as Hafner was able to successfully avoid the tag from Raabe. Brady Rupp took the loss for Wauseon despite going eight innings, giving up only four hits while striking out seven hitters and walking three. Hafner was awarded the win for Perrysburg. On Sunday Wauseon responded by defeating Findlay 3-1 to come out of the consolation bracket. They then clipped the Yellow Jackets by a final of 5-4, setting up a one game winner-take-all contest on Monday for the district championship. Results of that contest will be in Thursday’s edition of the Expositor.